Competition is important, but so is cooperation. From many points of view, in fact, cooperation is by far the more valuable but it is not an easy thing to teach in our very competitive world. What’s more, nothing spoils a family game faster than siblings bickering about losing or winning. For these reasons, I was very excited the first time I saw a cooperative game and I bought it despite our limited budget. That was years ago and Harvest Time filled many of our hours with pleasant play. In this game, one plants a garden and then harvests it before the frost comes. As a family of gardeners, this was very realistic to us. We also got Walk in the Woods and we vividly recall avoiding imaginary bugs, poison ivy and the hot sun as we spent time in the game’s imaginary woods when we could not be out in our real woods. A few years later we got Granny’s House, about getting to Grandma’s despite various obstacles. When we found used games, Deep Sea Diver, Mountaineering, and Explorers, all from the same company, we snapped them up. These educational cooperative games take up much more time than those for younger children and, because we bought three at a time, we did not fall in love with them as we did with the other games. Also at this stage of our lives schoolwork and jobs became more important and we played fewer games in general. Even so, these are interesting games and well worth the time. Of course we also play traditional competitive games but, perhaps because of our extensive experience with cooperative games, our family’s best game time is usually about spending time together in a relaxed way, not about winning or losing although that is definitely part of it. With some games, like Quirkle, we do not even keep score, although that’s partly because the scoring is complex. This approach to playing games can be frustrating for some. In fact, when she learned the rules of Harvest Time, one relative told the kids, “Let’s figure out a way to make it possible for people to win.” On the other hand, this approach is a great way to avoid the tears and tantrums that come when little ones lose games. Changing the competitive board game mindset brings a new appreciation for cooperation and allows some simple, low-stakes practice in this difficult skill. Intense, serious competition definitely has its place both in life and in games, but perhaps not as much of a place as our society assumes. As Christians we do not avoid competition; in fact, the Bible points out that it can help people excel. But we also want to foster love and cooperation, even in competition, for we are commanded to love our neighbor as ourselves. Cooperative games help us work with that idea and learn to understand it in a practical, countercultural way. 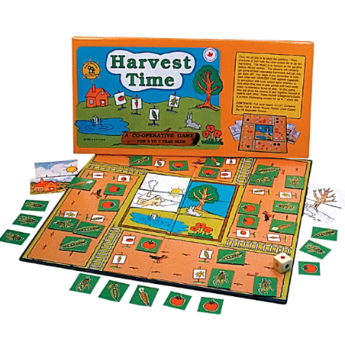 Harvest Time, Walk in the Woods, Granny’s House, Deep Sea Diver, Mountaineering, and Explorers are developed by and available from Family Pastimes which also sells many other cooperative games for all ages. If you enjoyed this, you might want to follow me on Google+, where I often mention helpful or interesting ideas, friend me on Facebook where I show up once in a while and am still a newbie, or connect with me on GoodReads where I share what I read. Disclosure: We are not compensated for discussing these games or mentioning Family Pastimes. This article may be linked to Inspire Me Monday, Raising Homemakers, Friendship Friday, Make My Saturday Sweet. Posted in: Canadian, Homeschool, Homeschool Tips, Reviews, Simple Joys.